Kalgoorlieite: Mineral information, data and localities. Named in 2016 by K. Rempel and C.J. Stanley after the city of Kalgoorlie, Australia. 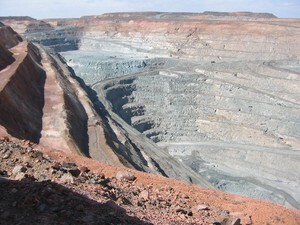 Kalgoorlie-Boulder is the mining town immediately adjacent to the Golden Mile Mines / Superpit, the type locality of the mineral. Known synthetic analogue (which has thermoelectric applications). Compare orpiment and laphamite: although chemical analogues and monoclinic, these are not isostructural with kalgoorlieite. Kalgoorlieite is the fourth oxygen-free As-Te mineral after benleonardite, debattistiite, and törnroosite. Carron, G.J. (1963) The crystal structure and powder data for arsenic telluride. Acta Crystallographica: 16: 338-343. Kanishcheva, A.S., Mikhailov, Y.N., Chernov, A.P. (1982) The crystal structure of arsenic telluride As2Te3. Izvestiya Akademii Nauk SSSR: 1982(6): 949-952. Stergiou, A.C., Rentzeperis, P.J. (1985) Hydrothermal growth and the crystal structure of arsenic telluride, As2Te3. Zeitschrift für Kristallographie: 172: 139-145. Morin, C., Corallini, S., Carreaud, J., Vaney, J.B., Delaizir, G., Crivello, J.C., Lopes, E.B., Piarristeguy, A., Monnier, J., Candolfi, C., Nassif, V., Cuello, G.J., Pradel, A., Goncalves, A.P., Lenoir, B., Alleno, E. (2015) Polymorphism in thermoelectric As2Te3. Inorganic Chemistry: 54: 9936-9947.